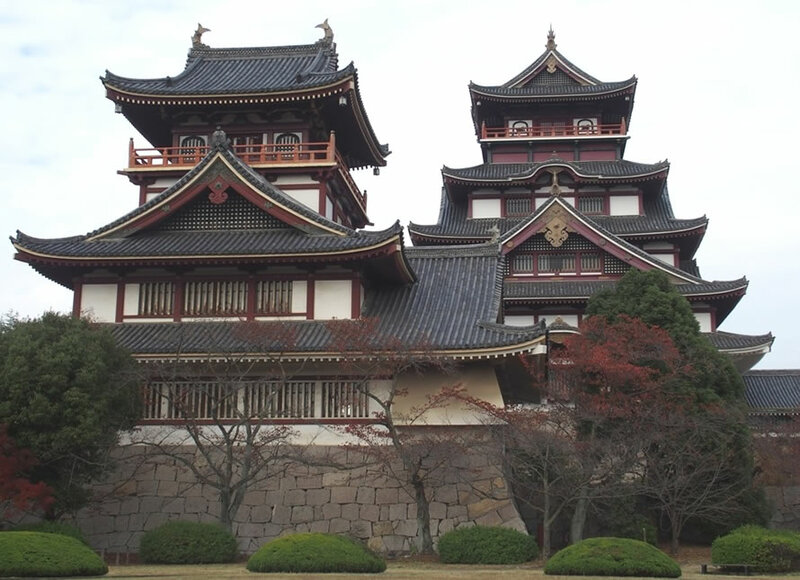 ▲Fushimi Momoyama Castle was built in 1964 as the symbol of Fushimi. This reinforced concrete replica keep soars high over Fushimi Momoyama Castle Sports Park (Momoyama-cho Okura, Fushimi-ku, Kyoto). The interior is not currently open to the public, but the surrounding area has been turned into a garden, so you can enjoy views of the castle from the outside as you stroll around (managed by the Kyoto City Sports Association). The tomb of the Emperor Meiji, to the south of this castle, has been built on the main bailey of the castle Toyotomi Hideyoshi built. The period of the late 16th century when Oda Nobunaga and his successor Toyotomi Hideyoshi ruled a newly-unified Japan is known to history as the Azuchi-Momoyama Period (1573 to 1603). The Momoyama part of the name comes from the numerous peach (momo) trees that were planted on the hill (yama) where Fushimi Castle once stood, making it famous for its blossoms. It was known as the Peach Flower Village for about a hundred years, but with the spread of the name Momoyama as one of the most important historical sites in Japan, later generations became aware of the place as well. In 1912, Mt. 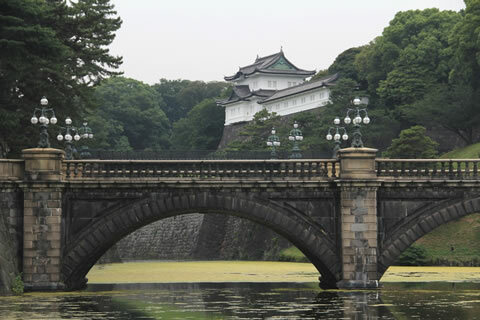 Kojo, where Fushimi Castle had stood, was used as the site for the Emperor Meiji's burial mound. As Fushimi-no-Momoyama-no-Misasagi (the Fushimi Momoyama Tomb), it still attracts people who come to pay their respects to the Emperor or wander the quiet paths amongst the deep green trees. The stations nearby, whether Momoyama on the JR Nara Line, Momoyama-Goryomae on the Kintetsu Kyoto Line, or Fushimi-Momoyama on the Keihan Main Line, all have Momoyama in their names, reflecting the fame of this site. The first castle in Fushimi was built by Toyotomi Hideyoshi on Shigetsu Hill (Momoyama-cho Taichoro, Fushimi-ku, Kyoto) in 1592. Following subsequent rebuilding and development, a castle town measuring 4 km east-west and 6 km north-south was formed. Its population swelled to tens of thousands, making it one of the biggest cities in the country after Edo, Osaka, and Sakai, and it served politically as the de facto capital of Japan. Central Fushimi was a neatly laid out cityscape of samurai residences belonging to various daimyo encircling the castle. Along with the development of the castle town, the banks of the Uji River were redeveloped and the Yodo and Katsura rivers linked, allowing the town to prosper as a riverside trading town. 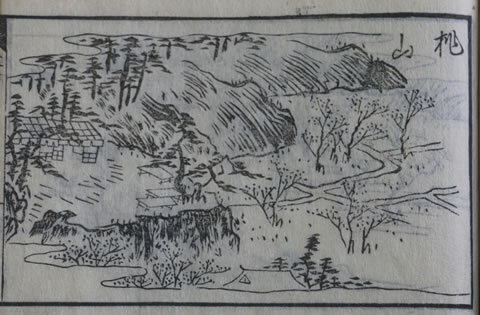 Roads were built along the tops of the banks, with the Kyo-kaido Road built on the Bunroku Bank linking Fushimi with Osaka Castle, and other major roads like the Saigoku-kaido, Yamato-kaido, and Otsu-kaido roads, as well as the Takeda-kaido and Fushimi-kaido roads leading to the capital, all passed through Fushimi. Thus, Fushimi became the gateway to Kyoto as well as a major land and water transport hub connecting Nara and Osaka. The area to the west of the samurai residences was home to merchants and artisans, who obtained official appointments to supply items to the samurai. Sake brewers also flourished in this area, supplying the castle town with the sake it demanded. From this point on, Fushimi's development as a city was linked to its wealth of water for sake brewing, leading to a concentration of the brewing industry here. ▲Fushimi Castle was abandoned in 1624. The keep was dismantled and shipped to Yodo Castle, while the towers, gates, stone walls and other parts were relocated to castles, temples and shrines around the country. One of the most important buildings that still allow visitors to sense the old Fushimi Castle is the Fushimi Tower that was relocated to Edo Castle in 1628 (photo), which can still be seen rising elegantly beyond the Double Bridge (nijubashi; the front stone bridge and the rear iron bridge) that lead from the Outer Gardens of the Imperial Palace. The Shrine Gate (shinmon) of the Gokonomiya Shrine is known as one of the places in Fushimi where remnants of the old castle can still be seen. The Gokonomiya Shrine (Gokogumonzen-cho, Fushimi-ku, Kyoto) is worshipped by local people as the chief guardian deity of the whole town of Fushimi, and enshrines the soul of the Empress Jingu, who is considered the patron goddess of safe birth. Its original name was the Mimuro Shrine. In September 862, sweet-smelling water gushed forth from this site, and drinking it was said to cure diseases and have other beneficial effects, so the Emperor Seiwa gave it the name Gokonomiya. Today, underground water is drawn up from the Momoyama hills and flows past the Main Hall, so all visitors can experience it for themselves. Ote street, the main street of the town, originally led out from the main gate (otemon) of Fushimi Castle. The great torii gate rising up near Momoyama-Goryomae Station on the Kintetsu Line straddles the old main street. Heading past the stone walls, which are said to have been built using stones from the original castle walls, visitors arrive at the shrine gate (shinmon) to the Gokonomiya Shrine. This gate was originally the west main gate of Fushimi Castle, and has been registered by the government as an Important Cultural Property. When Toyotomi Hideyoshi built Fushimi Castle in 1594, the Gokonomiya Shrine was relocated to the north-east of the castle, the so-called Demon's Gate direction. 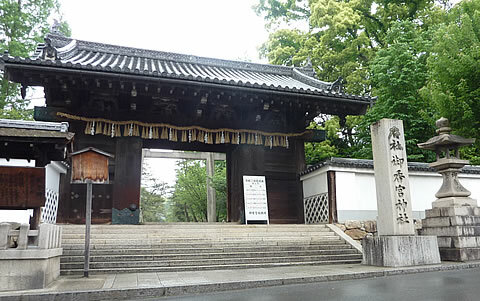 The area where the shrine was during Hideyoshi's time is now a sacred site called Furu-Gokogu, or Old Gokonomiya Shrine (Fukakusa Okamedani Furugoko-cho, Fushimi-ku, Kyoto). After Hideyoshi's death in 1598, the shrine was rebuilt in its original location, and the present Main Hall was erected in 1605. 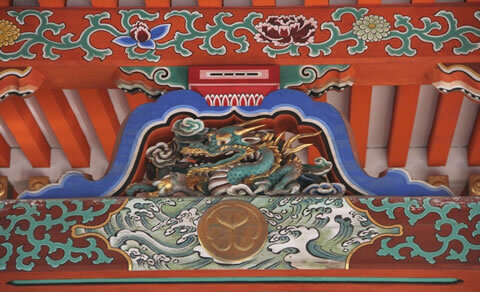 The Gokonomiya Shrine has been worshipped in the Fushimi area as the guardian deity for the changing power-holders and the samurai ever since. 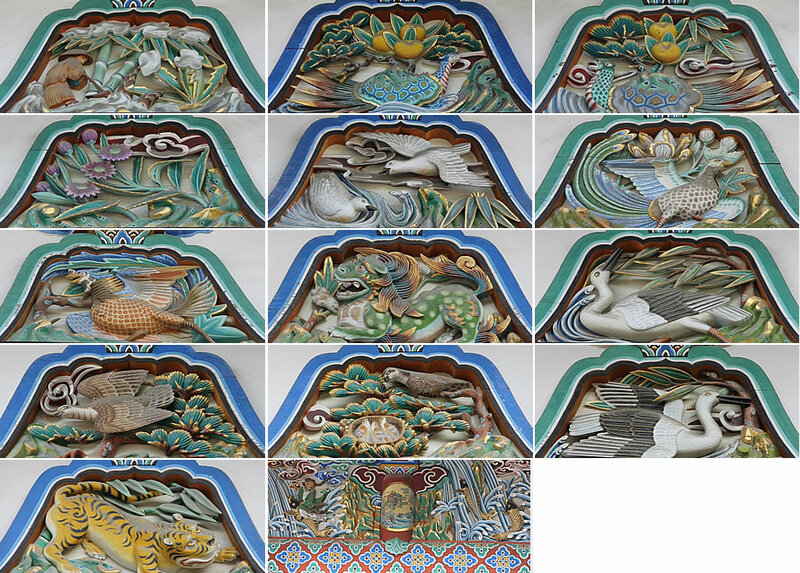 ▲The formal triple hollyhock crest of the Tokugawa clan can be seen on the Worship Hall end ridge tiles and other places. ▲On the eastern side of the Main Hall of the Gokonomiya Shrine is a subsidiary shrine of the Hokoku Shrine, which enshrines the soul of Toyotomi Hideyoshi (Left photo). The Toshogu Shrine, on the other hand, enshrines the soul of his rival Tokugawa Ieyasu, who eventually overthrew the Toyotomi family to gain power (Right photo). 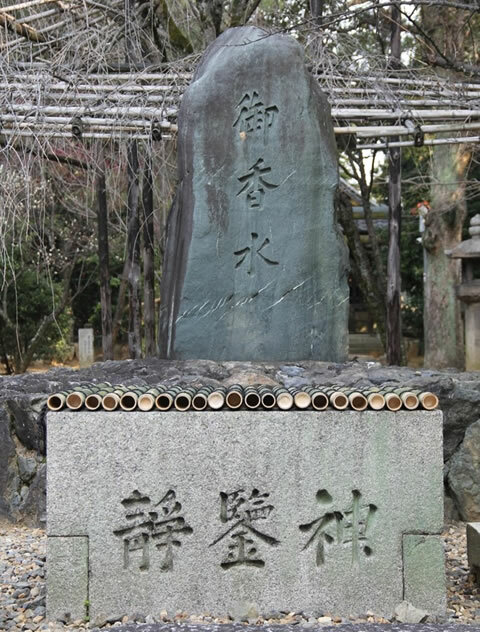 This Hokoku Shrine was erected after the Tokugawa period was over, in 1895, on the 300th anniversary of the construction of Fushimi Castle, and was eventually placed in the precincts of the Gokonomiya Shrine. In 1635, the "sankin-kotai" system, the alternate-year residence of daimyo feudal lords in Edo, was started, so all lords from the west of Japan would spend time in Fushimi, preparing their retinue, before carrying on to Edo. Along the Minamihama Road heading west from the Gekkeikan head office area were built honjin, special inns for daimyo to stay, as well as waki-honjin, subsidiary inns for their vassals to stay at, along with inns and boathouses lining the street, and a range of transportation businesses. The Kyo-kaido Road had post stations at Fushimi, Yodo, Hirakata, and Moriguchi, while sanjikkokubune (traditional medium-sized boats to transport goods and people) plied the Yodo River. Thanks to all there, the streets of Fushimi were bustling with travelers coming and going, and goods being shipped all over the area. All this also meant that there was a great demand for sake, and so dozens of sake breweries came to set up shop here. 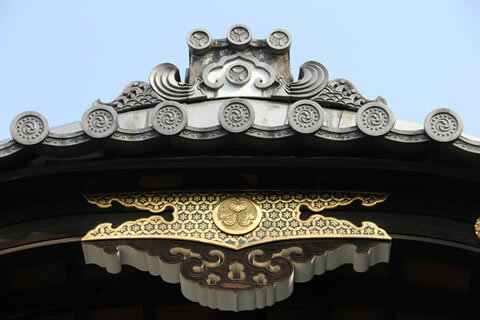 ▲An artifact dating back to the early Edo period, when Gekkeikan was founded. 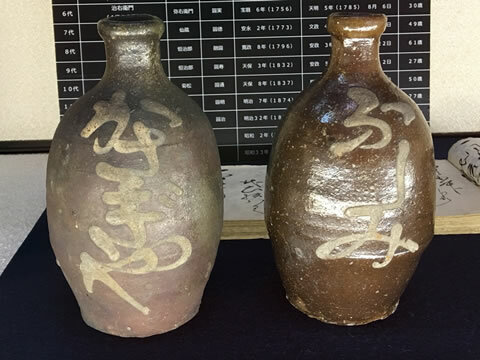 These earthenware tokkuri, or sake flask, depict the original name of the brewery, Kasagiya, on one, and the brewery's location at the time, Fushimi, on the other. Through its regeneration into a post town and riverside trading town, Fushimi sake was able to develop even further. At almost the same time, Gekkeikan was founded in 1637 in the Minamihama area, facing the outer moat of the castle town. 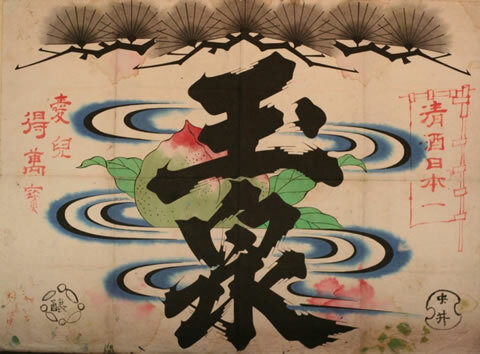 Taking the name of the birthplace of the founder, Jiemon Okura, Kasagi in the south of Kyoto Prefecture, the shop was initially known as Kasagiya, and its brand was called "Tama no Izumi" (Jewel of the Fountain). ▲A sample of the rice straw cover (shirushi-gomo) decorating the front of the barrel. The Tama no Izumi (Jewel of the Fountain) brand mark, which has been used since our founding in 1637, is depicted boldly on the front. Right after this, in 1657, there were 83 sake breweries in Fushimi, producing some 2.7 million liters of sake. In the Edo period, Fushimi sake was drunk mainly by travelers and locals as a local brew, but starting in the 1890s, following the expansion of railways around the country, sales expanded as well, starting in Tokyo and eventually covering the entire country, and establishing Fushimi as one of the major centers of production. ▲The oldest remaining ledger at Gekkeikan. 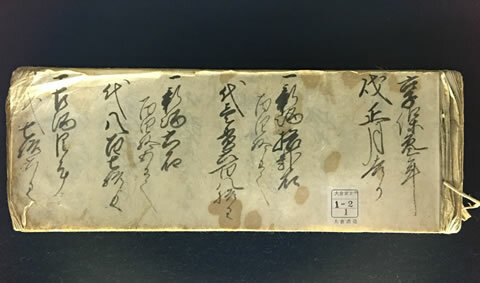 The first entries date back to 1718, and it is one of the oldest such accounting ledgers from the sake industry.